I guess there's been enough of them this year that a thread is worth starting. Entrance to the Citadel Mall Thursday morning, June 7. I wish I can post all the hail storms this year, its absolutely incredible!! Im just a one man crew though. This was in Texas yesterday. I now lost track of how many hail storms I've heard and read about this year alone. One thing I heard is atmosphere is still cold up there and wet bulbs are low at surface. I heard of huricanes, floods, tornadoes, even a wind storm causing millions and billions of damage..BUT A HAIL STORM NOW? I could be wrong but thats a first for me. 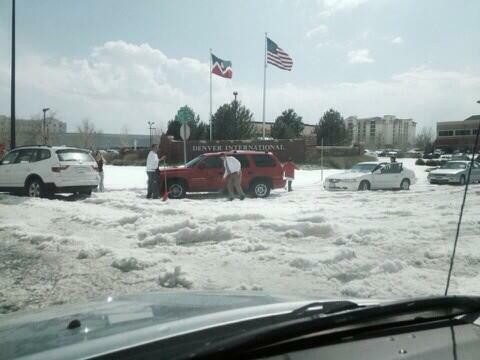 Hail usually only lasts a few minutes and locally.. But apparently this one will cost 500 MILLION dollars and they think its possible to reach the 1 BILLION dolar damage mark. Check out the videos with the news story!!!! In Witney, Oxfordshire (west of London). Maybe Dunno or Ben have better photos? That pic with the firefighter was the talk of the month...I remember posting that as well. Its beyond baffling to me to see that much accumulate. I really wish I can find all my hail posts or othes and condense it here. Maybe I'll do a search. OMG. My jaw started dropping half way in, stones got bigger and wind picked up. You can hear the glass breaking! and just look at the twigs being broken off just by the hail itself. I can even imagine a hail storm like those. Add this one to the list. Happening right now!
" this photo of michelle jones perfectly illustrates what is happening in and around La Junta, CO right now." 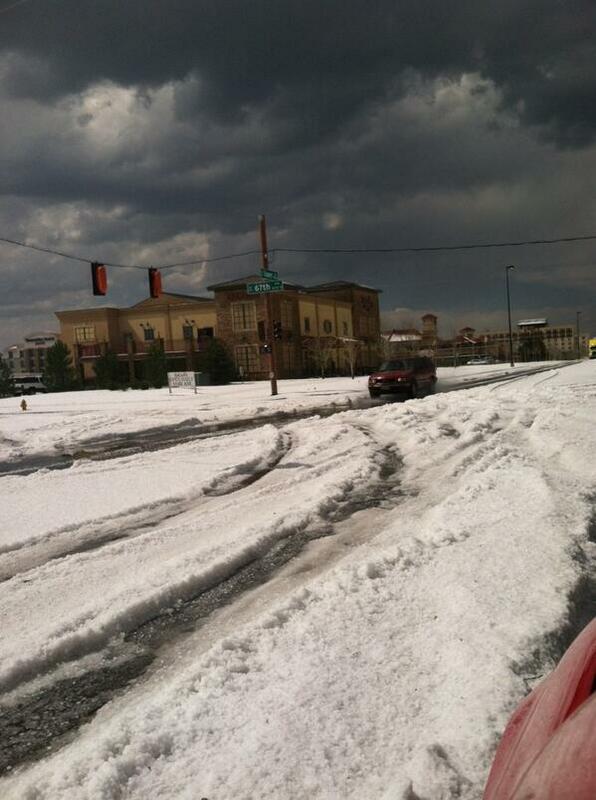 Thought I revive an old thread by posting a Hail Storm that happened today in Colorado. Almost half foot of accumulating hail in Denver. Colorado vs PA. What happened in NY and PA today looks like something that happens in the Plains/Rockies.